Adrienne + Chris were married on September 26, 2015 (two days before the hubby and I celebrated our two year anniversary) at Cousiac Manor in New Kent County. I will always remember Adrienne because she took a chance on me and Maggie's Misc back when I first started the business last year! 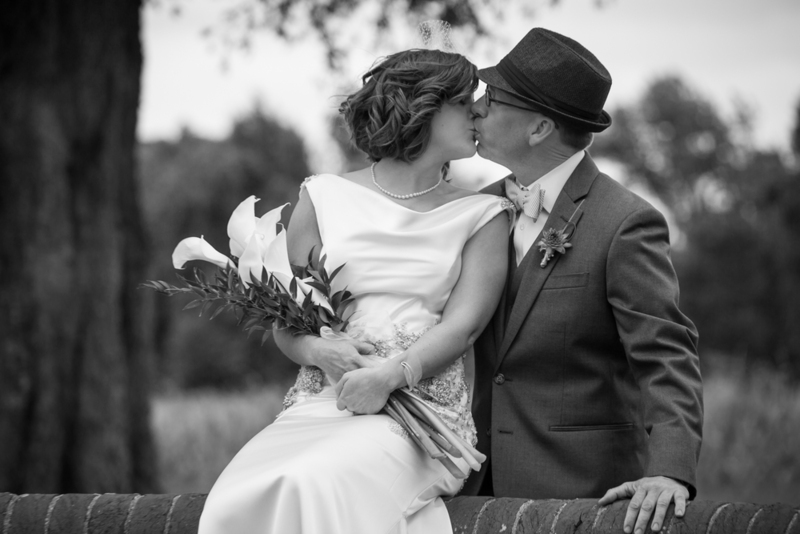 She hired me to help with some partial planning and from our first conversation I could see that what she really wanted for their wedding day was a time of celebration for her and Chris, their families, and their friends. She worked tirelessly over the last year to ensure that their special day would be full of FUN and good cheer! And that's just how the wedding turned out. The guests had an amazing time. They "whipped and nae naed". And even the rain couldn't bring these two down! The week leading up to the wedding, we quickly realized that rain was going to be inevitable. However, Adrienne + Chris took this in strides and set their minds to make the best out of it! They decided to go with the rain plan, and by having the ceremony inside the barn where the reception also took place, the whole day became very cozy and intimate. The rain (fortunately) held off until after the reception so they were able to get some really fun first look photos like this one of Chris peeking at Adrienne out of the food truck window for the first time (my favorite!). I could tell from the moment that Adrienne started walking down the aisle to Chris that her love for him was true and sweet and that she was moved by the gravity of what was about to take place. The ceremony was lovely: one part sweet, one part funny, one part sentimental. Cousiac Manor is an old property that has recently been converted into a barn. They picked this venue because it was close to Adrienne's "Pop" in Williamsburg and her mom in Mathews. Therefore, Adrienne + Chris decided to play off of the barn and have a somewhat rustic inspired wedding. With everything from the arbor hand built by Adrienne's mom and her cousin Judie (out of twigs from her mom's backyard no less!) to the goodie bags for guests to take home leftover cookies, to the homemade apple butter party favors, Adrienne + Chris simply thought of everything! Most of the decor and design pieces were handmade or DIY projects by Adrienne, Patsy, Chris' mom, Carol, and Judie. They even made these adorable signs directing guests up the several-mile-long gravel drive leading up to the venue. Sayings like: "You're almost there", "Just Kidding", and "You do have 4 wheel drive right?" set the stage for the guests for the rest of the evening. For dinner they featured two different food truck options for guests to choose from: hamburgers and fries or BBQ. 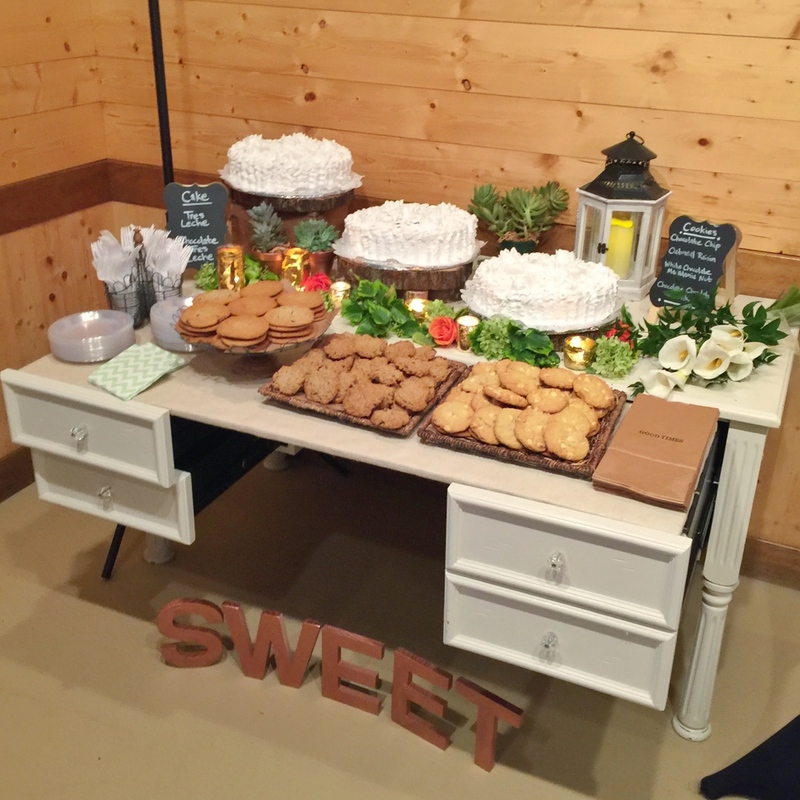 In addition they had finger foods, hot and cold apps, three different cakes, and lots and lots of cookies. Guests loved it. Adrienne + Chris will be celebrating their honeymoon in Hawaii this February (how fun!). I wish them much happiness and love along their journey and hope that they come back to each other again and again in this covenant of marriage they have created. Congrats again you two! Newer PostMaggie's Top Five "Awkward Photos"